Curator Julia Farley discusses some of the objects in the exhibition Celts: art and identity that help to answer the question: who were the celts? Cauldron. Silver, partially gilded, 100 BC–AD 1. Gundestrup, Denmark. Diam. 69 cm; H. 42 cm. (c) The National Museum of Denmark. Classical authors conjure up a fantastical picture of a strange people, unfamiliar to the civilised inhabitants of Greece and Rome. The Greek historian Diodorus Siculus, writing in the first century BC, tells us that they were prone to arrogance and overindulgence – addicted to wine and frequently drinking so much that they fell into a stupor. The men grew their moustaches so long that when they were drinking, it was as if the liquid passed through ‘a kind of strainer’. They dressed ostentatiously in brightly coloured shirts and trousers, and striped or checked coats. They were hospitable hosts, welcoming strangers to their feasts, but they were fierce warriors, and quick to take offence at the smallest provocation. In battle, some charged into the fray naked, while others wore elaborate horned or animal-crested helmets, perhaps like the example below, dredged from the River Thames near Waterloo. Yet Diodorus also remarks that, for all their warlike swagger and boastfulness, these were not an uneducated people. He writes that they spoke in riddles, hinting darkly at their meaning and using one word to stand for another. Among their number were poets, and philosophers who could foretell the future and were so well respected that they could halt an army in full charge. This is an immediate and engaging picture, but it leaves us with more questions than answers. These ancient descriptions might be very rich, but they are varied, and very few are based on first-hand evidence, so the real people behind these stereotypes continue to elude us. Sources vary on where and when these people lived. 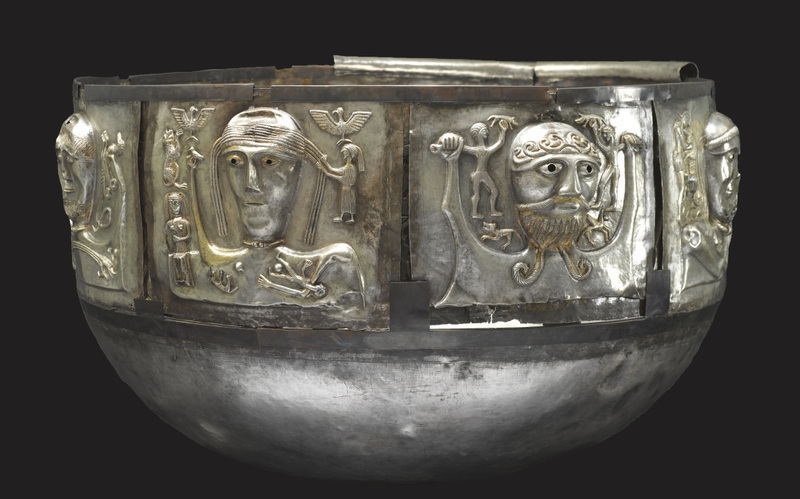 There are few objects to show us how the Celts represented themselves, although the extraordinary silver cauldron from Gundestrup in Denmark (pictured below) shows people wearing and using Celtic objects, and coins made in the Celtic world reveal a complex and varied iconography. The Celts left no written records of their own to tell us about their society, or whether indeed they were a unified group. It is much more likely that their lives revolved around smaller tribal, ethnic or family units. Much of their world is lost to us, but archaeology is gradually filling in the details of how these peoples lived. Celts: art and identity tells the story of the Celts through the incredible objects they made. Shortly after 500 BC, around the time the Parthenon was being erected in Athens, a very different art was taking shape north of the Alps. In contrast to the clean, naturalistic lines of Greek art, the peoples that Greek writers would come to call the Celts were inventing their own way of representing the world. 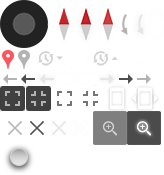 Theirs was an abstract, shapeshifting art, which writhes and transforms in the eye of the beholder. From one angle a sinuous line might resemble leafy tendrils, from another perspective it resolves into a hidden beast or bird. On close inspection, the swirling plant-like decoration on the circular shield boss from Wandsworth (pictured below) becomes two waterbirds, rearing back with wings outstretched, each with a single webbed foot curling down in front of its hooked beak. Like the riddling speech alluded to by Diodorus, the simple lines and curving forms of this Celtic art hint at complex meanings which could only be decoded by those familiar with its mysteries, a knowledge now long forgotten. By around 300 BC, versions of this art style had spread across Europe, from the Atlantic to the Black Sea. Although Britain and Ireland were never explicitly referred to as Celtic by the Greeks and Romans, they were part of this world of shared art, values and beliefs. Where the Greeks, and later the Romans, saw a single people, archaeology reveals a mosaic of communities, connected but also locally distinct. The torc (a kind of metal neck-ring) is one example of how our understanding has changed. To the ancient Greeks and Romans, torcs were a universal symbol of Celtic identity, but in fact it was not an exclusively Celtic phenomenon. Men and women across Europe and beyond wore torcs to display their power and status. Even within the Celtic world, the shape, design and decoration of these neck-rings varied from region to region, and it is likely that they were used to express local identities, rather than a universal ‘Celtic’ one. A stunning example (pictured below), a silver torc from Trichtingen in Germany on loan from the Württembergisches Landesmuseum in Stuttgart, weighs over 6 kg. The terminals are made in the shape of cow or bull heads, each wearing a tiny torc of its own. By around 50 BC, life across much of Europe was changing. From around 200 BC, Roman control had gradually expanded to create an empire that extended from Spain to Syria and across North Africa. After the conquest of Britain in AD 43, the lives of the local inhabitants were dramatically transformed, both within the Roman province of Britannia and beyond its frontiers. In the south, the Roman army led the construction of forts, towns and cities with new facilities like amphitheatres and bathhouses. Local people mixed with invaders and settlers from around the empire, creating a cosmopolitan world where Roman and indigenous ways of life combined to create a unique Romano-British culture. Ireland and northern Scotland were never conquered, but people were still affected by the impact of Rome. Communities here found themselves the neighbours of a powerful empire, and responded by creating objects that reflected their independent, non-Roman identities. One such example is the massive armlet (the technical archaeological name!) from Belhelvie, on loan from the National Museum of Scotland. It was made in Scotland while southern Britain lay under Roman rule, and is decorated with a distinctive local style of art that echoes earlier Iron Age motifs. Massive armlet. Copper-alloy, AD 50–150. Belhelvie, Aberdeenshire, Scotland. H. 11.5 cm. National Museums Scotland, Edinburgh. After the fall of the Western Roman Empire, a distinctive form of Christianity emerged in Ireland, Scotland and western Britain, regions which were outside the old heartlands of Roman control. Monasteries in these areas stood out as European centres of art and learning. Although connected to wider Christian communities across Europe, they continued to develop their own local traditions, and their languages, art and religious practices set them apart. The name ‘Celts’ had fallen out of use after the Roman period, but it was rediscovered during the Renaissance, when people became more interested in understanding their own local histories. From the 16th century, ‘Celts’ was used as shorthand for the pre-Roman peoples of western Europe. In the early 1700s, the languages of Scotland, Ireland, Wales, Cornwall, Brittany and the Isle of Man were given the name ‘Celtic’ to reflect their pre-Roman origins. In the context of a continually shifting political and religious landscape, ‘Celtic’ acquired a new significance as the peoples of these Atlantic regions sought to affirm their difference and independence from their French and English neighbours, drawing on long histories of distinctive local identities. Over the following centuries, a Celtic revival movement led to the creation of a rich, reimagined and romanticised Celtic past, expressed in art and literature. Although the Celts are not a single people, a distinct race or genetic group that can be traced through time, the idea of a Celtic identity still resonates powerfully today, all the more so because it has been continually redefined to echo contemporary concerns over politics, power and religion. The word Celtic continues to strike a chord, both nationally and globally. For most people, it has now come to stand for the distinctive local histories, traditions, music and languages of the modern Celtic nations: Brittany, Cornwall, Ireland, the Isle of Man, Scotland and Wales, and for people around the world who trace their ancestry back to these regions. ‘Celtic’ is still a word that creates a sense of difference, but what began as a label applied to outsiders by the ancient Greeks has now been proudly embraced to express a sense of shared heritage and belonging, reflecting a long history of regional difference and independence.